We had a ton of rain over the past day, with downpours after midnight. 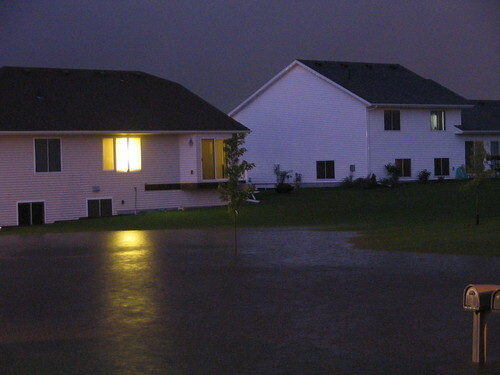 A neighbor called at 1:30 this morning to warn us that “Lake Churchill” was in effect. Our new sump pump performed like a champ. The biggest worry was if the power went out. Then we were D-U-N, done. I decided to stay up while the flood warning was still in effect. Did some wiring in the basement and setup on my new “office.” I just checked on the water levels. They’ve receded, but not much. Just a few feet, really. It’s kind of weird. With all the watery sounds (eaves, water lapping at our lawn, etc), standing outside in the quiet really feels like I’m at a lake. Especially because there are many of the same telltale bug-noises in the air. More pictures at Flickr. Excuse the blurriness. The pictures were taken at 2AM with a shutter speed of 1.6 seconds.